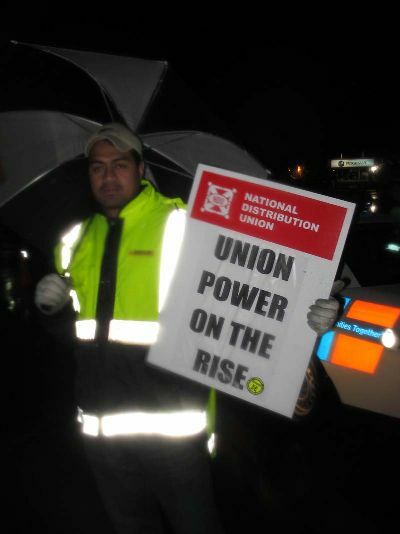 Five hundred distribution workers who supply the 165 Countdown, Foodtown and Woolworths supermarkets across New Zealand began a 48 hour strike at 5am this morning starting a weekend of industrial action against Progressive, says the National Distribution Union. The Progressive’s Supply Chain distribution center workers began their 48 hour strike at 4am this morning in Auckland, 80 Favona Rd Mangere, 6am in Palmerston North, cnr Mako mako Rd and Mihaere Dr, and 6am at the two Christchurch centres on Shands Rd and Columbo St.
Workers are striking for a single nation-wide collective agreement with equal pay rates and all existing allowances combined into a site allowance of up to $2.50, an 8% pay rise and an extra week service leave. New Zeal I note that former Socialist Unity Party member, Wayne Ruscoe is helping this campaign in Christchurch for the Engineers Union. Judge McDonald Gets It Right!